The reason (yet again) for my lengthy blogging absence is due to the dreaded lurgi. When people tell you about the many tricky things that come hand in hand with having children (lack of sleep, abundance of mess, inability to enjoy a flight ever again…) why don’t they tell you about nursery bugs? More often than not, Vita goes to nursery, comes home, and a day later gets ill. Then follow a hellish few nights of fever and not sleeping, and then, just as she’s turning the corner, down falls the husband, and – soon after – me! Somehow, three weeks disappear and all you’ve done is either try to occupy the child, or try to get someone else to occupy the child while you are confined to bed. Here is my review of Deborah Levy’s powerful new novel Hot Milk for the Spectator. Here is my interview with the brilliant Tracy Chevalier about her favourite fictional trees for lovely website Five Books. 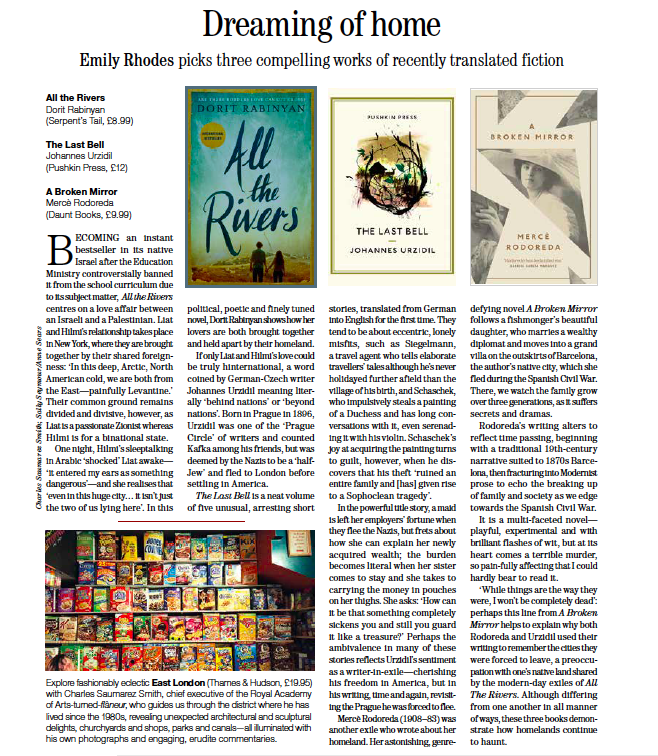 And my review of Helen Oyeyemi’s bizarre and beautiful short stories What is Not Yours is Not Yours should be coming out in Country Life in the next couple of weeks. Watch this space, as they say. Also, a reminder that Emily’s Walking Book Club is meeting this Sunday to discuss Elizabeth and her German Garden by Elizabeth von Arnim, which is the most heavenly book– all about gardening, and marriage, and trying to evade one’s responsibilities. When I last wrote here, I was on my way up to Moniack Mhor, a writers’ retreat in Scotland in order to take the writers on an Emily’s Walking Book Club special. We wandered through a beautiful beech wood and along a mossy glen, while talking about Angel by Elizabeth Taylor, which is about a girl who becomes a rather ridiculous writer.This is what prompted me to read Nicola Beauman’s biography of the writer, The Other Elizabeth Taylor. Nicola Beauman founded Persephone Books, whose gorgeous grey-covered books include such gems as Someone at a Distance by Dorothy Whipple, Mariana by Monica Dickens, The Far Cry by Emma Smith, The Exiles Return by Elisabeth de Waal, Harriet by Elizabeth Jenkins (and many more). So I was rather in awe of this biography – not only is it about a great writer, it is written by a very amazing woman! One of its great joys is that you can hear Nicola Beauman’s voice, very distinctly, throughout. It is full of asides and parentheses which make her opinion absolutely felt. It can be something as slight as: ‘At one the speaker goes on talking for too long, as speakers do …’ or, when discussing the somewhat unconventional name of Elizabeth Taylor’s first son, noting that it ‘must have caused comment at Atlast’, the home of her very middle-class in-laws. Occasionally Beauman takes us off on a longer personal digression. Particularly moving, is when she writes about going to visit Ray Russell. Elizabeth and Ray had an affair which lasted for many years. In the Acknowledgements, Beauman notes that ‘she believed it was inappropriate to publish the book’ until after the death of John Taylor, Elizabeth’s husband, who authorised the biography. Then, ‘following his death, she submitted the manuscript to John and Elizabeth Taylor’s son and daughter: They are, alas “very angry and distressed” about the book and have asked to be disassociated from it.’ One suspects that this is largely due to Beauman’s writing about Elizabeth’s affair with Ray, but surely a biographer is supposed to unearth these things? Not least because the hundreds of letters that Elizabeth wrote to Ray not only ‘chart an extended love affair’, but – crucially – ‘they reveal the development of a writer’s art over the decade that Elizabeth would call wasted because she was not published’. I’ve not read many biographies, so can’t say if this is the norm or the exception, but I loved how personal this one is. I had the same feeling as when I read The Hare with Amber Eyes and felt that I was on the journey of discovery hand-in-hand Edmund de Waal; or when reading Penelope Fitzgerald’s letters, in which she writes about her awful struggles with L.P. Hartley’s family for her attempted, eventually abandoned, biography. I could almost see Ray sitting there with the ‘sadness written in every line of his body’, and absolutely shared Beauman’s ambivalence on discovering this cache of letters. Virginia Woolf was a modernist but because she eschewed the domestic she could be labelled as such: Elizabeth, because she wrote about women and children and housework and dailiness, could not be. When Elizabeth said, as she often did, that she wrote in scenes not narrative, perhaps she was suggesting that women have to write in scenes because narrative needs leisure and an uninterrupted run of time to write it. I loved The Other Elizabeth Taylor, just as much as I loved the two Elizabeth Taylor novels I’ve read. It left me longing to read more, and as soon as I finished it, I whizzed off to buy Elizabeth Taylor’s At Mrs Lippincote’s and A Game of Hide and Seek. Heaven to have these two treats in store even if they will probably be read, alas, when we’re next all ill.
We’ll be talking about Mrs Palfrey at the Claremont on the Walking Book Club this coming weekend, so I thought now was as good a time as any to read another of Elizabeth Taylor’s novels. Angel has been warmly recommended to me many times, and, it transpires, rightly so! Lax and torpid, she dreamed through the lonely evenings, closing her eyes to create the darkness where Paradise House could take shape, embellished and enlarged day after day – with colonnades and cupolas, archways and flights of steps – beyond anything her aunt had ever suggested. She was learning to triumph over reality, and the truth was beginning to leave her in peace. She decides to write a novel based on her daydreams, set in 1885 at ‘Haven Castle’ where ‘white peacocks wandered on the moonlit terrace the night Irania was born’. I feel an extraordinary power behind it all, so that I wonder if it is genius or lunacy. Angel indeed possesses an extraordinary power. Through sheer force of will and imagination she propels herself forth from her unpromising start in life to a wealthy published novelist. Indeed she ends up actually living in Paradise House – her fantasy becomes reality. Some of Angel’s stories about her lately-acquired portrait-ancestors were disastrously comic; her sense of period was so vague and her notions of country-life wonderfully sensational. A handsome young man among dogs was going off to shoot his rival in a duel, not pheasants among the autumn foliage; a lady in an Empire gown had been a mistress of Charles the Second… She went to the Royal Garden Party in violet satin and ostrich-feathers with purple-dyed chinchilla on her shoulders; amethysts encrusted her corsage and mauve orchids were sewn all over her skirt where they quickly wilted. Glances of astonishment she interpreted as admiration. Dismayed and indignant tradespeople received copies of her novels or old photographs of herself; they invariably returned them but by that time the account had been written off in Angel’s mind. Angel stubbornly adheres to her fantasy right until the end, and you can’t help but feel a searing affection for her, admiration for maintaining her headstrong perversity, refusing to be brought down to bleak reality by anything or anyone, ever in all her life. Hermione could imagine her sitting under the sea, casting spells, counting the corpses of the drowned. A strange figure to Clive, in her long, faded red dress and with her black hair hanging down her back. Cats followed her, arching themselves and cavorting about the hem of her skirt, bewitched by her presence. Indeed you can see why Angel might seem like a witch – as her publisher said, she has an ‘extraordinary power’ and perhaps it is easier to explain this power as witchcraft, something not of our own world and not quite right. But really what Angel possesses is the power of fiction – the novelist’s craft. Her stories might be ridiculous but they grow beyond the page, envelop the reader and the writer, grow more real than reality. Angel’s novels are the opposite to Elizabeth Taylor’s – they are over the top, impossibly romantic, passionate and daft as opposed to Taylor’s domestic observations of everyday minutiae. And yet both novelists were panned by the critics. (Angel decides they must be jealous of her talent.) It begs the question, how can these two authors create such different novels and yet both be so easily dismissed by the literary establishment? Perhaps, with Angel, Elizabeth Taylor is having a little jibe at the critics. Luckily Elizabeth Taylor, unlike Angel, has a wonderful sense of humour, and it is infectious, seeping out of the page and making it impossible not to laugh as soon as you recognise an element of Angel in yourself, or in someone else. Certainly, next time an eccentric local author comes into the bookshop, draped in purple chinchilla and carrying a pile of signed copies of their book, then I might not be able to resist pointing them in the direction of this wonderful novel, to which they will undoubtedly be able to relate. Having said that, I suspect I will foist it upon others too – it is a magnificent book, dazzling and dark at once, like witchcraft, and I can’t see how anyone can help but fall under its spell. Here, for your delectation, are my favourite books of the year. That is, books that I read over the past year, rather than books that were published over the past year. It must be strange and exhausting to read only the newest of books. I have to admit that I find those ‘books of the year’ lists that one reads in the newspapers at this time of year a bit dull. Lists are only really interesting when one understands the rationale behind the selections. So this is less of a listy-list (listless, ha!) and more of a chatty, discursive one. Looking back, I suppose this year’s reading has been dominated by old women. This was my year of Jane Gardam – first The Man in the Wooden Hat, then Old Filth, then (again) – to calm pre-wedding jangles – A Long Way from Verona. And to keep Jane Gardam company, there was also Diana Athill’s Instead of a Letter and Elizabeth Taylor’s Mrs Palfrey at the Claremont. All brilliant books. All written with elegance and subtlety and quite brilliant matter-of-fact wit. Some of these had a certain ‘coming-of-age’ element, which I inevitably find irresistible. For that very reason, other books of the year were Monica Dickens’ sublime Mariana and Dodie Smith’s I Capture the Castle – both of which can happily be described as ‘hot-water-bottle fiction’, i.e. blissfully comforting and snug. They would probably make it on to my desert island books. It’s also been a year of reading rather a lot about houses, thanks to the novel I’m writing about a derelict house. Particularly good books, in which houses feature rather prominently, have been (as well as the already mentioned Mariana) Bowen’s Court, Howards End, The Small Hanand Rebecca. Bowen’s Court is written in such a unique voice, and is rather long, and I read it rather concentratedly (often in the bath) that by the end I felt like I’d made a new friend. It helped that Elizabeth Bowen had told me so much about her family and her own personal history during the course of her book. I long to read more by her and often think back to that very great voice booming through my head in the echoey bathroom and wish I could listen to it some more. I suspect I might revisit her in my Christmas reading. Howards End was every bit as brilliant as I expected it to be. I really do think that Forster is one of the very best writers. Although that’s a terribly unfashionable opinion to hold. And Rebecca. Well I suppose Rebecca, like Mariana, combined a house book with a coming-of-age story. Winning combination as far as I’m concerned. Someone famously said of it that it’s the only book where the murderer gets away with it. That throws a rather alarming light on it. The other classics that I’ve really adored this year have been Beware of Pity by Stefan Zweig and a newly-published collection of Edward Thomas’s poetry. I’d been longing to read Beware of Pity ever since I read and loved Zweig’s autobiography The World of Yesterday a year or so ago. Beware of Pity is intensely psychological, a bit like Crime and Punishment, and is written so breathlessly that there aren’t even any proper chapter-breaks. It really is almost impossible to put down. Oddly enough, I read it soon after reading Crash by J.G. Ballard and tried to draw some comparisons between these two books about crippled people, but ended up just feeling bemused that the books could both revolve around the same thing but be so irreconcilably different. It was a joy to return to Adlestrop with Edward Thomas’s Selected Poems. Nature poet extraordinaire. I should also like to add in here by first encounter with Gavin Maxwell in The Ring of Bright Water, which was the perfect thing to read in the Outer Hebrides – a funny, eccentric book about living with an otter in Scotland. Although the best bit isn’t actually in Scotland, it’s when he’s trying to take his otter home on an aeroplane and the otter causes utter farcical delightful chaos. But enough of all this old stuff, I have read some new things too. And actually some of them were quite cutting edge and very very good. They made me feel tinglingly excited about writing today. Ali Smith’s There but for the is a delightful riff of a book, jumping from pun to pun to pun, all within bigger meta-puns. It’s very clever but also very enjoyable. A playful love of language radiates from the book, which makes it hard to resist. Landfall by Helen Gordon was very good too, seeming to be quite a normal sort of book and then suddenly swerving into something quite extraordinary. 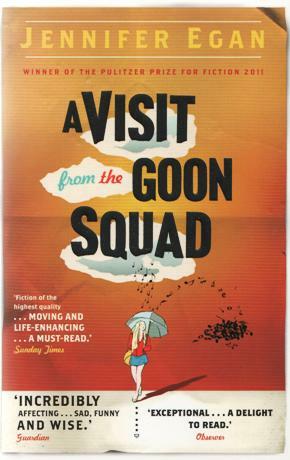 But – best of all – is A Visit from the Goon Squad by Jennifer Egan, which I’ve just finished reading. This book has been so ridiculously over-hyped that I almost felt I knew so much about it just from everyone going on and on about it that I couldn’t quite be bothered to read it myself. But oh my god what an absolutely genius, brilliant book. It is written with such verve, so sharp, so funny – yet also quietly sad. It’s a book which screams NEW YORK at you. It is New York. Essentially, Egan looks at a group of characters who work in the music industry. Each chapter takes one of the characters at a certain time (jumping back several decades hopping forward into the future and stopping off at moments in between) and captures various moments in their lives. I loved it and could go on about it for hours, but shall limit myself here to one particular aspect that I found to be fascinating and brilliantly-realised: the future. There are two chapters set in the future. The first one is written in power-point slides, as though, by then, this is how people communicate. Lawns are a dream of the past, as you have to have loads of carbon credits to get them now, and there is a strange alien solar plant which also harvests moonlight. The other chapter sees the very clever invention of ‘pointers’ – toddlers who ‘point’ at what they want on people’s ubiquitous ‘handsets’ and thereby determine powerful trends. So, for instance, several bands have brought out songs to appeal to ‘pointers’, because the children literally ‘point’ at the handset to download it and the sales shoot through the roof. Having endured several nauseating conversations by yummy mummys in the bookshop about how ‘Little Rupert and Milly’ are so intuitive with their iPhones, this felt like an alarmingly plausible vision for the near-future. It is WEIRD how tiny children take to iPhones and iPads so easily and intuitively. How weird to think that this could be such a strong connection that it could essentially make them the ultimate consumer. I shall end, appropriately, with Julian Barnes’ A Sense of an Ending. I expect, as it won the Booker, you’ve probably read lots about it already. It is very clever, very addictive and it’s likely that, as soon as you finish it (which will be soon after you start, as it is slim and so unputdownable), you will want to start again to try and figure it out. The cold, sparse way in which it’s written didn’t bother me as much as it might have done. Perhaps it was because it’s a cold, detached sort of story so that style is perfect. It’s a very good book. And a beautiful object too. All in all, a brilliant year of reading. I wonder what next year holds in store. There are few feelings I hate more than the anxious, distracted restlessness that arises from not knowing what to read. Given that I work in a bookshop, this feeling comes with an added tinge of guilt, of knowing that it is inexcusable to be surrounded by hundreds of thousands of books everyday, and not to be able to pick one out. The feeling tends to arise when I am tired of reading a particular type of book, and feel that really I ought to read something different. Having had a bit of a binge on mid-twentieth-century novels by women – I Capture the Castle, Mariana, Westwood – I felt that perhaps I should read something more recent, written by a man. Perhaps even some non-fiction. I dipped in and out of the new Charles Nicholl book, Traces Remain, but, try as I might, couldn’t get into it. I read a very fascinating book for research for my novel, Jewish London by Dr Gerry Black. But that counted more as reading for work rather than reading for pleasure. I found myself reading rather a lot of articles in magazines and listening to the radio more than usual. And then, after a week or so, the realisation sank in that I wasn’t actually reading a book at all. The horror! So I abandoned my resolution to read some new male non-fiction and settled down to something by Elizabeth Taylor. The author, not the actress, just to clarify. Ever since I started working at the bookshop I’ve had half an eye on the little collection of Elizabeth Taylor novels lined up on the shelf. Published by Virago, they have rather distinctive covers, which I’m not quite sure whether or not I like. 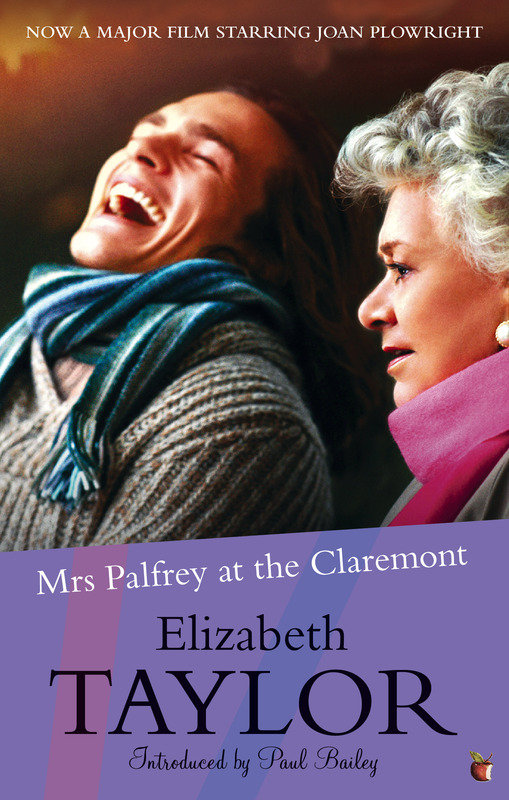 The prompt came when my agent (yes, this is a new, exciting development for the novel …) said that I might enjoy Mrs Palfrey at the Claremont. And indeed I did. Mrs Palfrey at the Claremont is a book about old people. It is the story of Mrs Palfrey, a widow, who arrives at the Claremont hotel in South Kensington, where she wants to live out as much of the end of her life as she can. There are other residents at the Claremont, gossipy old women and one old man, all with their own particular eccentricities and foibles, mostly on the verge of senility. The characters are drawn with the perfect mixture of sympathy and detachment. The sympathy creates pathos and understanding for these poor old women with their painful varicose veins, or arthritis, or forgetfulness. But there is just enough detachment for this to be rendered with a wry humour, stopping short of cruelty, but preventing the prose from being too worthy and sanctimonious. And this detachment makes the characters more clearly delineated. Rather than being vague, wafty old people, the fact that they can be shown to be a little spiteful, or petty, or interfering, makes them far more real. He still neither came nor wrote, and she heartily wished that she had never mentioned him at the Claremont. She began to feel pitied. All the other residents had visitors – even quite distant relations did their duty occasionally; they came for a while, over-praised the comfort of the hotel, and went relievedly away. It was inconceivable to Mrs Palfrey that her only grandchild – her heir, for that matter – should be so negligent. Mrs Arbuthnot, on one of her worst arthritis days, condoled with her spitefully, and that night Mrs Palfrey could not sleep. She fretted through the small hours, feeling panic at her loneliness. I must not get fussed, she warned herself. Getting fussed was bad for her heart. She put on the light and took a pill, and wondered if the morning would never come. Mrs Palfrey is upset partly for the sake of keeping up appearances – ‘she heartily wished that she had never mentioned him at the Claremont’ – and partly out of indignation that her grandson will inherit her money in spite of doing nothing for her. These aren’t particularly noble reasons, but they are at least honest, and this honesty makes one sympathise with poor Mrs Palfrey, who, after all, isn’t in particularly good health, and gets ‘fussed’ and ‘fret’s and ‘panic’s about it miserably. It’s particularly clever that within this expert probing of Mrs Palfrey’s loneliness, Taylor manages to slip in some keen observations of other people too. The other residents’ visitors ‘did their duty occasionally’, coming only to speak empty words and then to slip away ‘relievedly’. That ‘relievedly’ is very telling. Relieved that they aren’t old and don’t have to live at the Claremont with its dotty inmates? Relieved that they don’t have to shoulder the burden of their old relative? Relieved that their duty’s done for the month? And Mrs Arbuthnot offers Mrs Palfrey condolence, but only out of ‘spite’, because her arthritis has been particularly painful. Somehow all this insight is delivered lightly and easily. Nothing is overegged or treated clumsily. Taylor renders her characters sympathetically yet she is not completely averse to gently poking fun at them, of saying, really, they’re all as bad as each other. Mrs Palfrey gets herself into a pickle with her grandson and, when she falls down and is rescued by an impoverished young aspiring author, asks him if he’ll play the part of her grandson and come for dinner at the Claremont. Soon she begins to feel rather grandmotherly towards him, and he almost like a grandson to her. This is slightly tainted by his use of Mrs Palfrey as inspiration for his novel, but only slightly. I think that’s exactly right. The characters can seem funny and eccentric, but underlying this is a great deal of pain and sadness. Next time an old dear comes into the bookshop and spends twenty minutes vacillating between greeting cards, before complaining about the price and pointedly counting out coppers and 10ps to cover it; or asks about an obscure out-of-print book that she feels is somehow my fault for not being available, and for which I deserve an earful; or just wants to whine at me about something, anything, sucking the life out of me like a dementor … well I’ll think of Mrs Palfrey with her ‘noble face, dark eyebrows and a neatly folded jowl’, who ‘would have made a distinguished-looking man’, and feel far more tolerant. I’ll also think somewhat enviously of Elizabeth Taylor and wish that I could write half as well as her.